Lisa Caryl, a reader of this blog, was so taken with a beautiful jewelry gift her friend received as the mother of a bridegroom, she shared it with me. 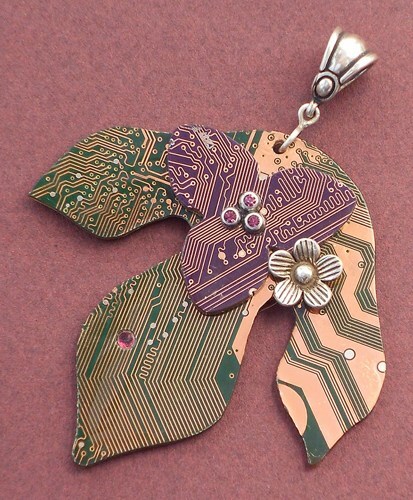 Amanda of the Blue Kraken on Artfire's wonderful recycled circuit board jewelry certainly wowed! 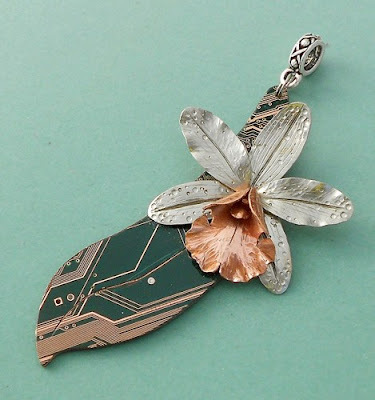 These designs coupled with metal smith techniques are some of the most beautiful recycled jewelry I have seen. 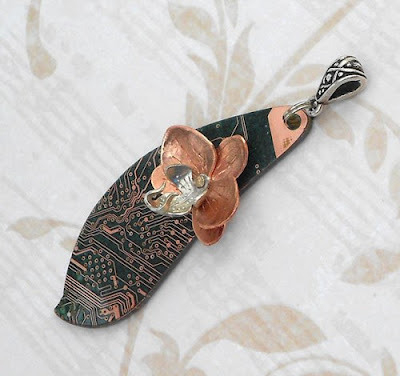 It is a testament to her skill, attention to detail and ability to use different metals effectively. 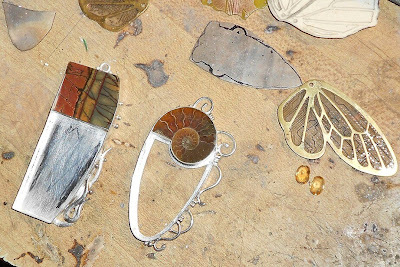 She uses many metal smith techniques such as riveting, hammering, tooling organic shapes, bezel work. 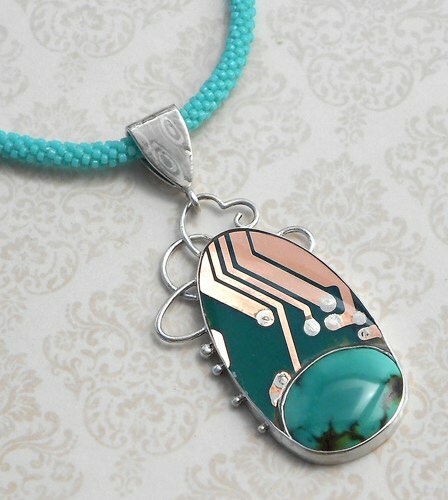 She also incorporates bead work, resin work and chain maille in her collections. 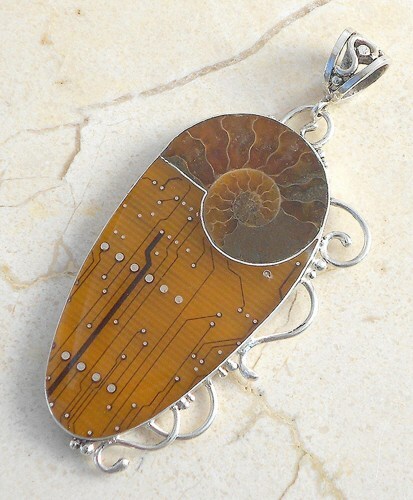 One of my favorites is her outstanding sterling silver ammonite fossil pendant in amber tones. It is a beautifully rendered mix of ancient and new. Note the sterling silver she uses is recycled. Here is a view of Amanda's work table from her Facebook page. She knows exactly what she is doing. She explained, "All the boards I use are RoHS compliant circuit boards which do not contain lead, mercury, cadmium, etc. The boards are stripped down to only the fiber core and the copper clad veneer eliminating the majority of all contaminants. The boards when fully cleaned are only made of layers of epoxy and woven fiberglass laminated together with copper foil. Some boards may contain cotton or polyester instead of fiberglass. The boards are also all covered in a clear lacquer coating I use as a sealer." That's really cool she takes the trouble to source the right boards. Deconstructing boards which contain toxic metals can be hazardous especially for the artisan. Thanks Lisa for the tip on this amazing designer!